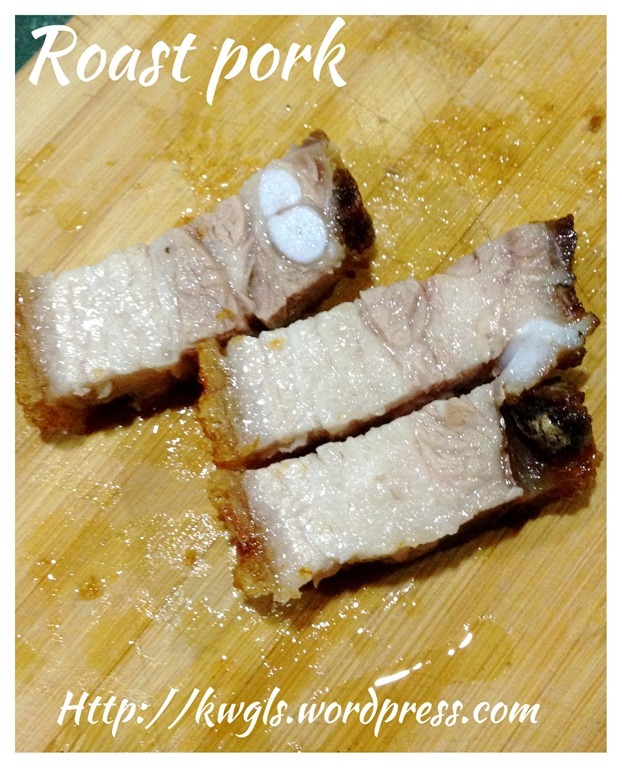 Two days after my previous attempt, I decided to prepare another piece of roast pork.. As usual, I get a piece of “fattest” pork belly that the butcher had.. Apparently, this piece is thicker and have slightly more fats. I have decided to test my theory of hole poking.. I did change a bit of my procedures. 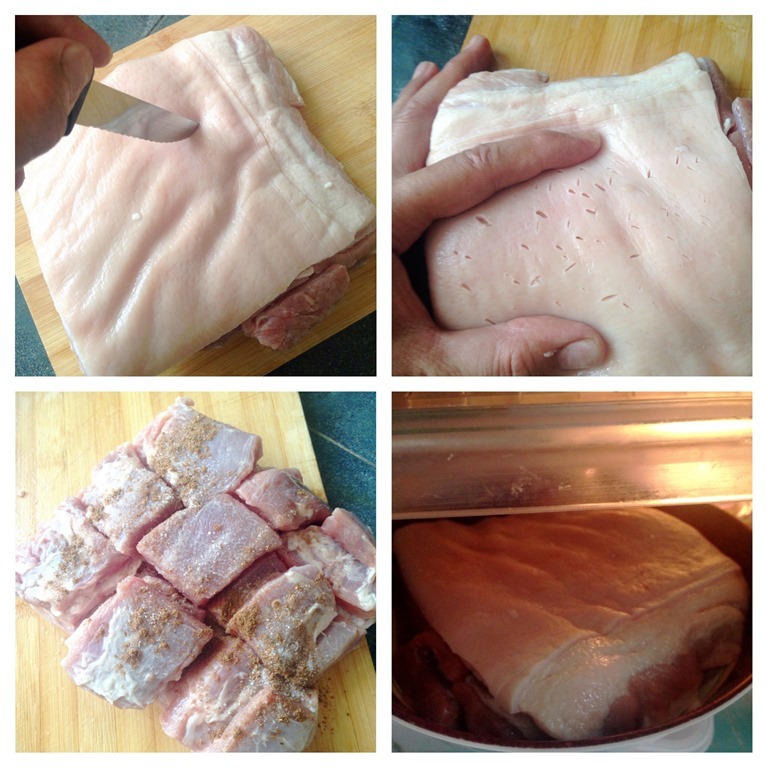 After I clean the pork, I pat dry (without scoring the skin) and air dry under the hot sun for about 1-2 hours. I then leave it in the fridge uncovered for about 3 hours until I was free. The skin was rather dry then. I baked in the oven for about 15 minutes for the skin to get cooked. Once the skin get cooked, I used safety pin to start poking holes. 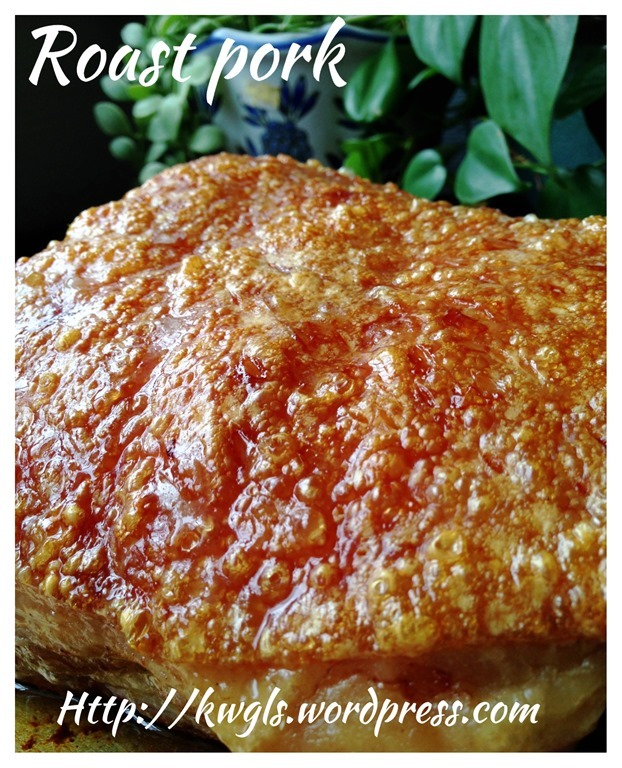 It is rather fast because cooked skin are very tender. Even a needle can easily pierce the skin as compare to uncooked skin. For every 10 minutes, I took out and pierce until I can’t poke any more. 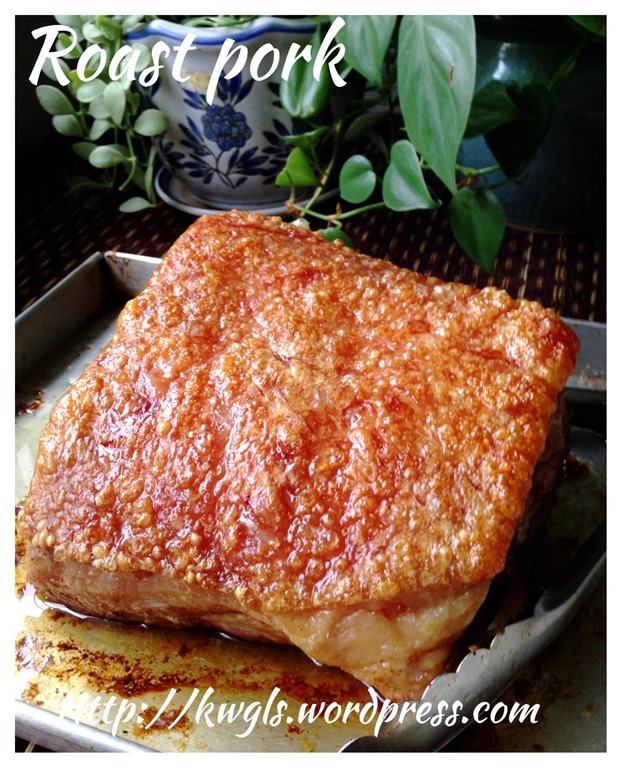 Can’t pierce is because the skin have been cooked and become crispy. 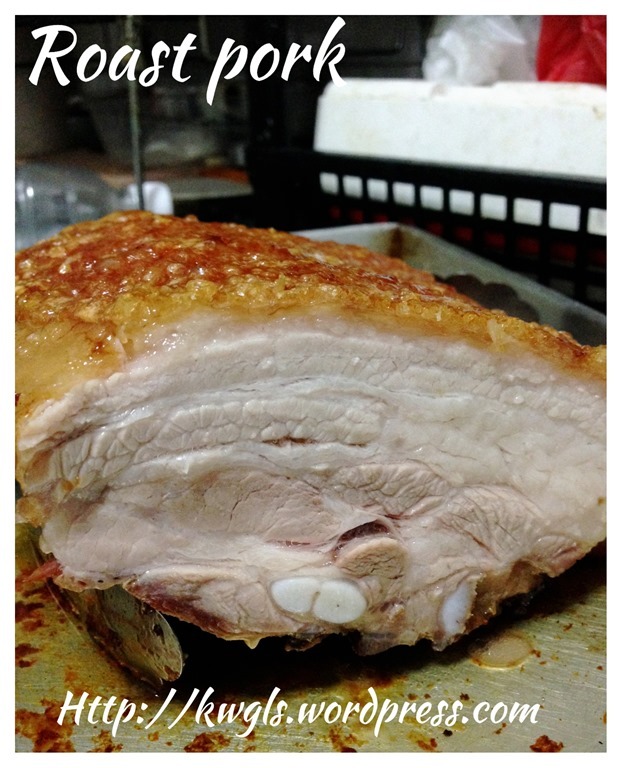 Readers must remember that as long as you can still use the needle or safety pin to poke, the pork is not ready. If you are concerned about the meat under the skin is not cooked, you can insert a thermometer inside the meat. As long as it reaches 80 degree Celsius, the meat is cooked. This attempt is rather fast, about 1 hour for such a big piece of meat. If your skin is chewy, your skin is not ready and as what I explained above, you should still be able to poke. You must poke until the needle can’t go any further. If part of the skin is chewy, it is likely that particular part is lower than the other.. 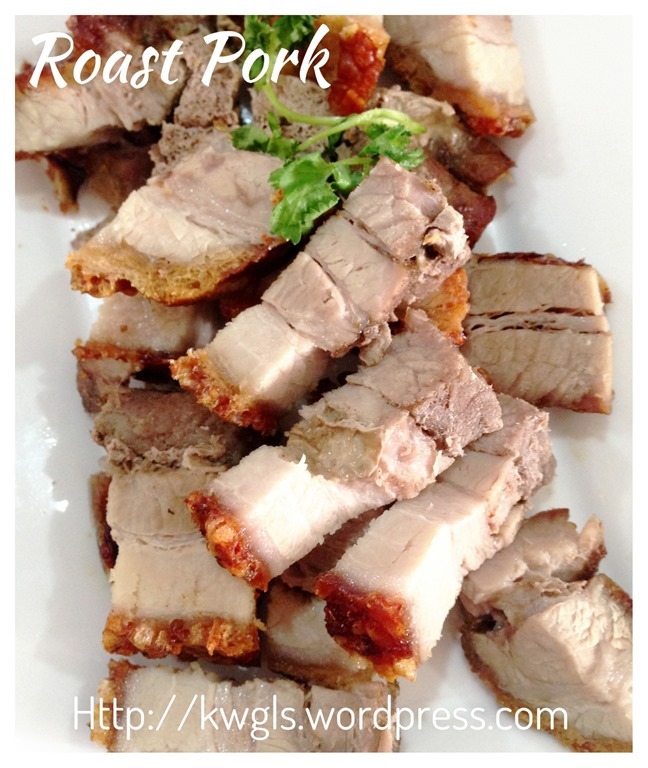 If that is the case, you have to ensure that your roast pork is of the same level. Think of way to raise that part (usually in the middle of that piece of the meat). Otherwise, either one part is not crispy or all are crispy but some are burnt. 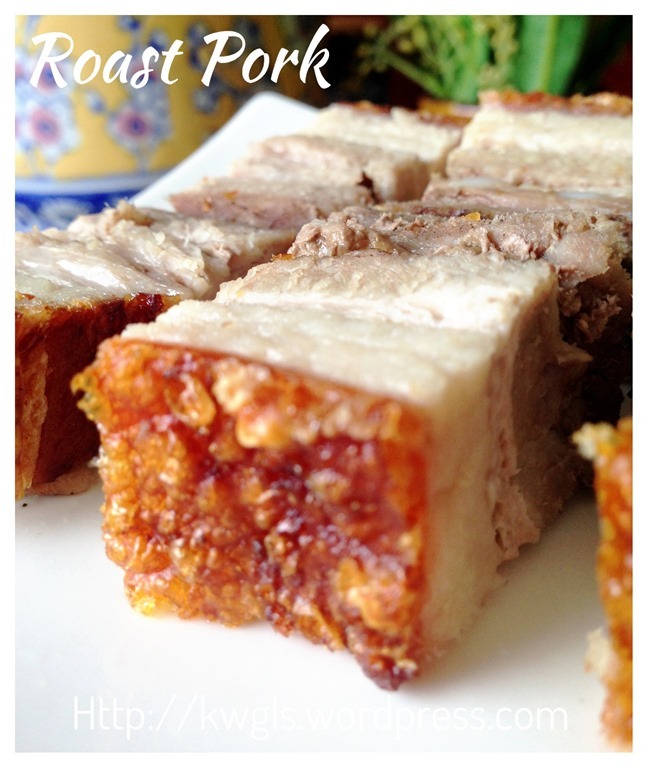 My wife and son love roast pork. 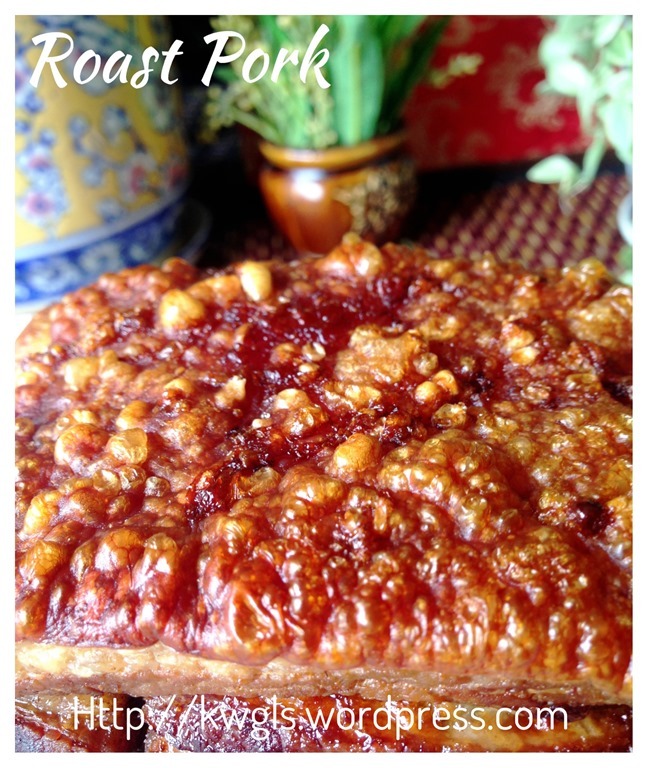 though I do not really like the commercially sold roast pork as it is rather salty and expensive..
One year ago, I had an attempt to roast some pork belly but it created a phobia in me to have further attempts. 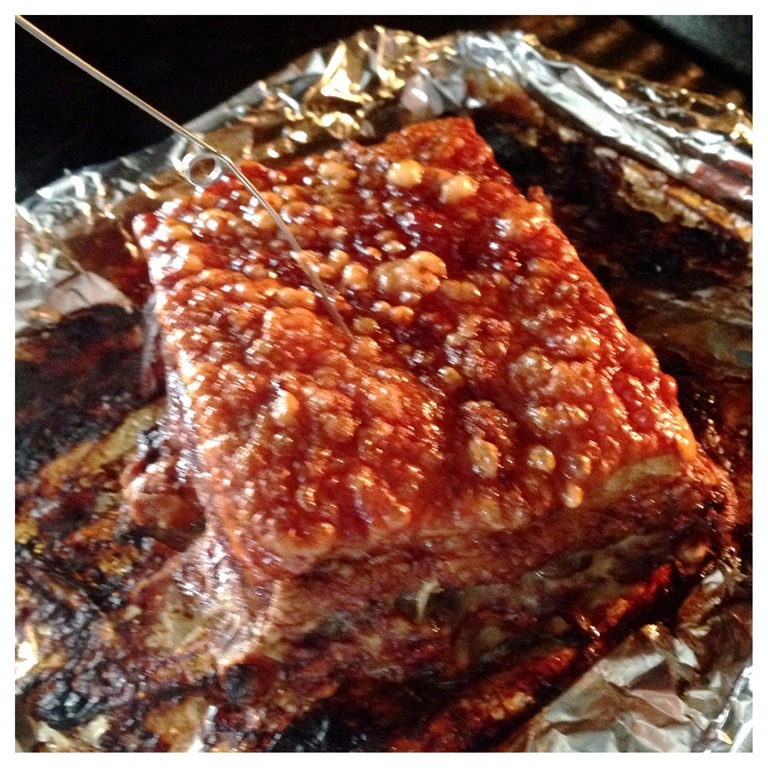 Unsure of the reason of the failure of that attempt, while roasting the pork belly, there are lot of cracker like “pip – pop” sound in the oven. Not only that, the whole oven was sprinkled with lard and it start to burn and smokes were rushing out of the oven… On the next day, I have the difficulty of cleaning the entire oven and since then I am not courageous enough to try. 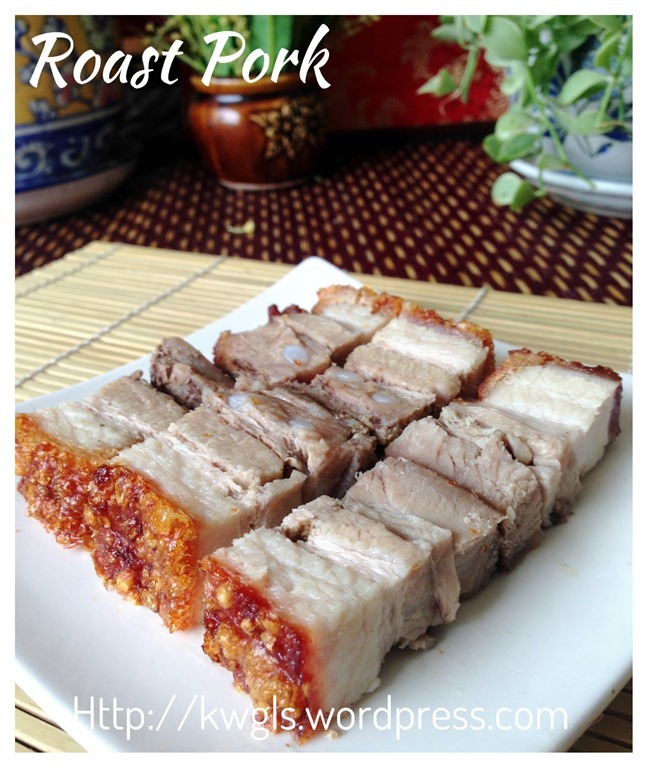 Until today, I am still unsure of the reasons for the previous failure..Well, let it be a mystery then..
Roast pork is rather common among members of Facebook Group.. 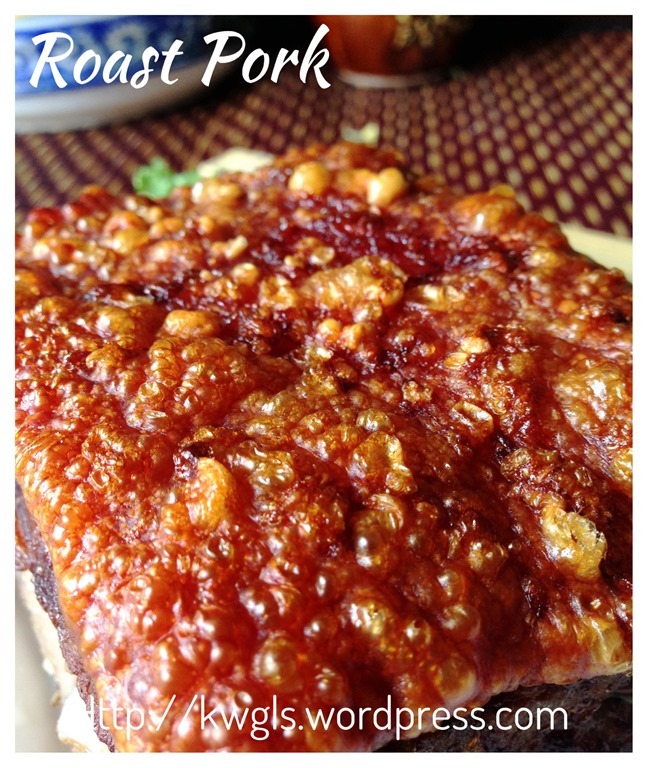 Most of them have some nicely roast pork with skin that looked very crispy. I told myself that I must give it a try again to complete my recipe list. In fact, I do not have much choices at all… all other stores are selling the same thing.. Trust me.. this is not the first time I encountered such a problem, I am unable to secure pork of reasonable fatness to prepare some authentic Chinese cuisines like Dongbo meat and I was told that pork with more fats were reserved by restaurants and hawker stores . As far as I am concern, It is a joke to ask the butcher to reserve a piece of “fatty” meat!!! I gave up! 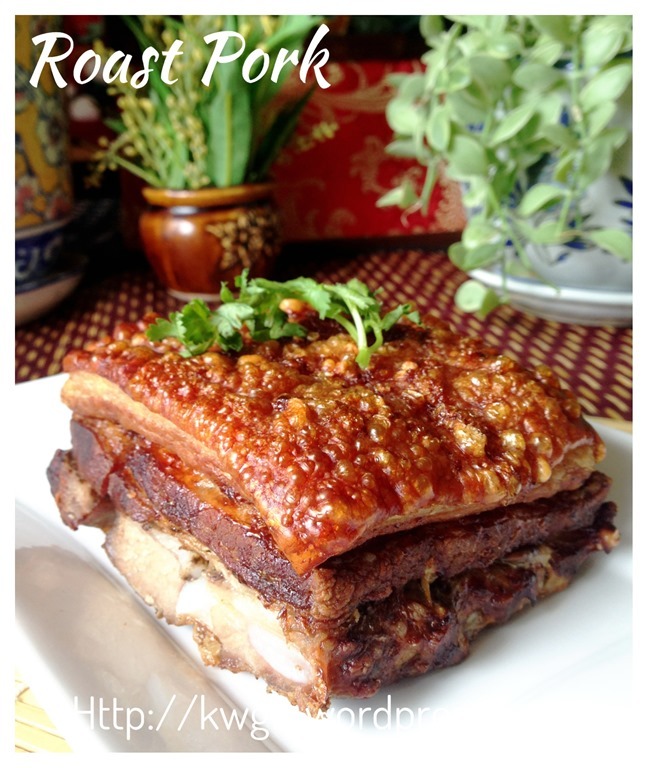 As the pork is rather lean, this roast pork may not look as attractive as it should be.. Hope you can understand my situation in Singapore and bear with me this less than satisfactory lean roast pork.. By the way, it was all finished within one meal and what I can ensure readers is that the skin is very crispy. 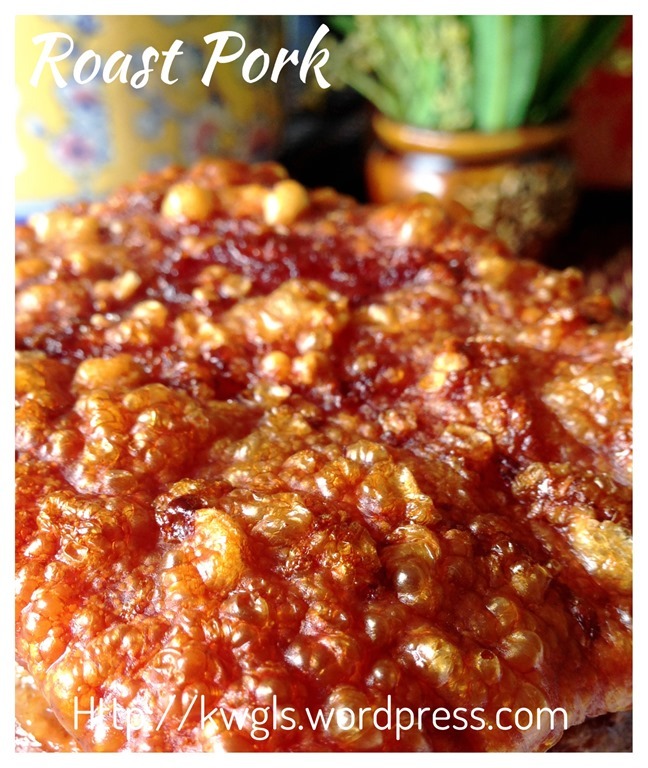 There are essentially no recipe for roast pork. 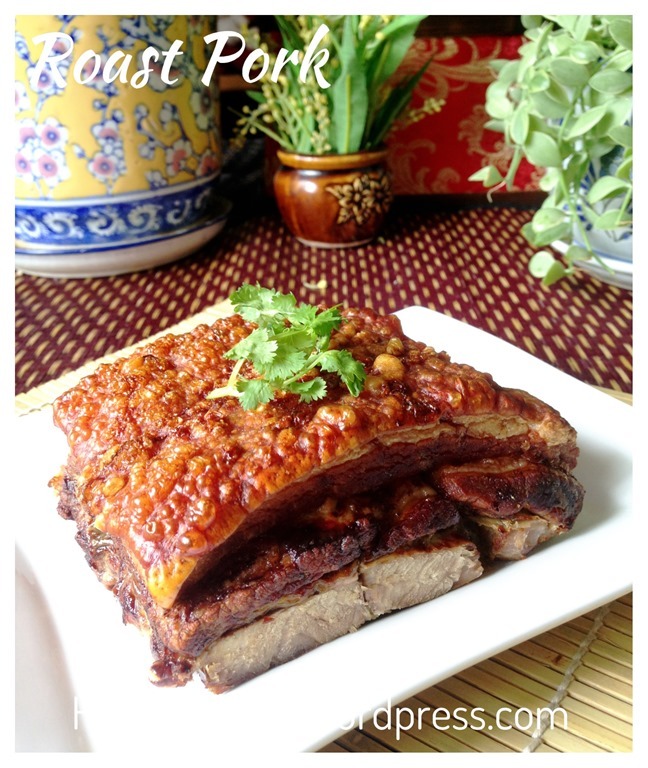 as it was only marinated with salt, five spice powder and some Chinese cooking wine. 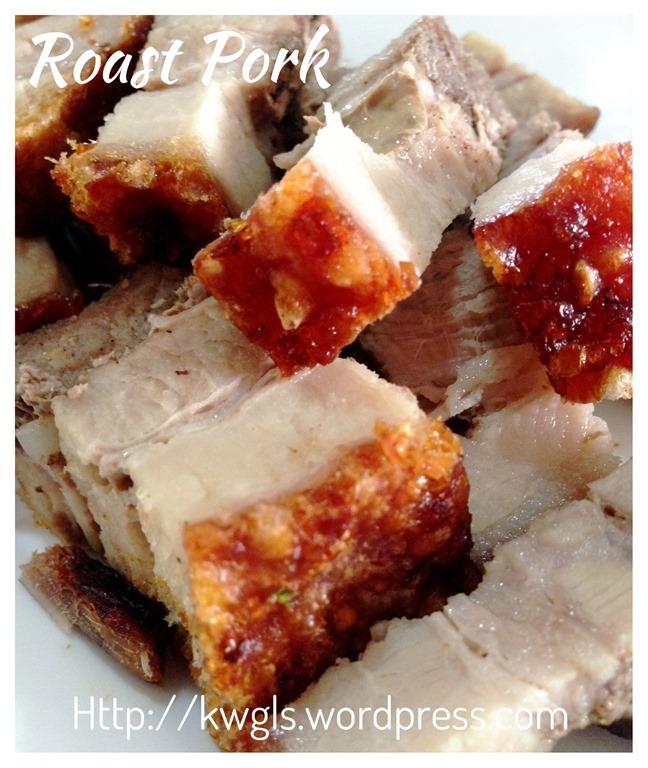 However, they are some pointers that need to be noted when roasting the pork. Note: No quantity was listed as it will depend on the size of meat you used and your family’s taste bud. 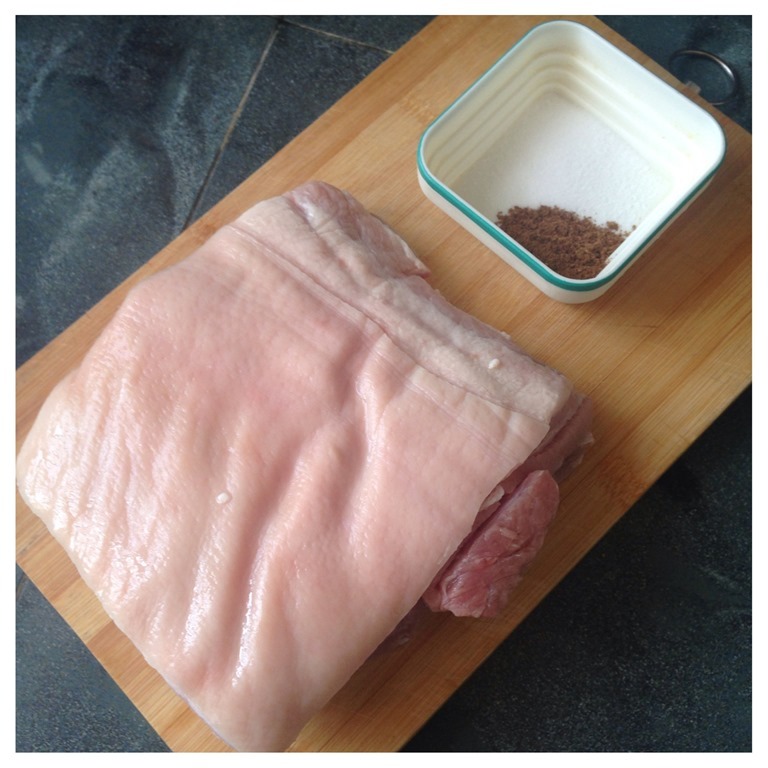 Season the underside of the pork belly with some salt, five spice powder and Chinese cooking wine. 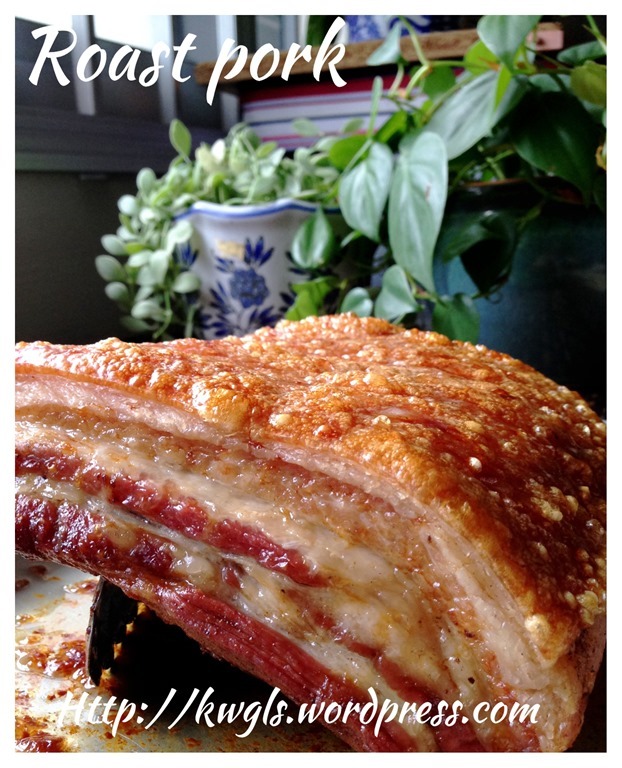 Use a kitchen towel to pat dry the skin and air dry the pork belly in the fridge or dry under the sun. It will take 3-4 hours or best overnight. 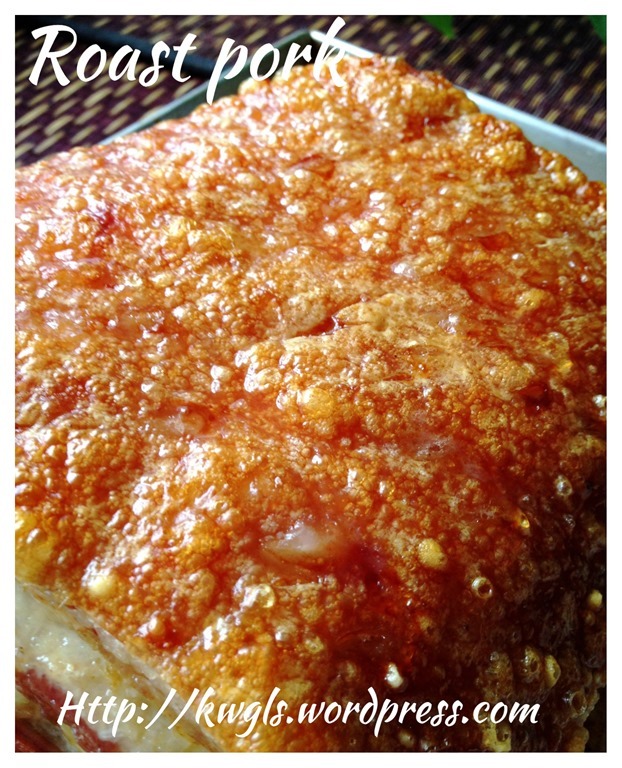 Before roasting, the skin of the pork belly shall be very very dry..
Pre-heat the oven to 190 degree Celsius. 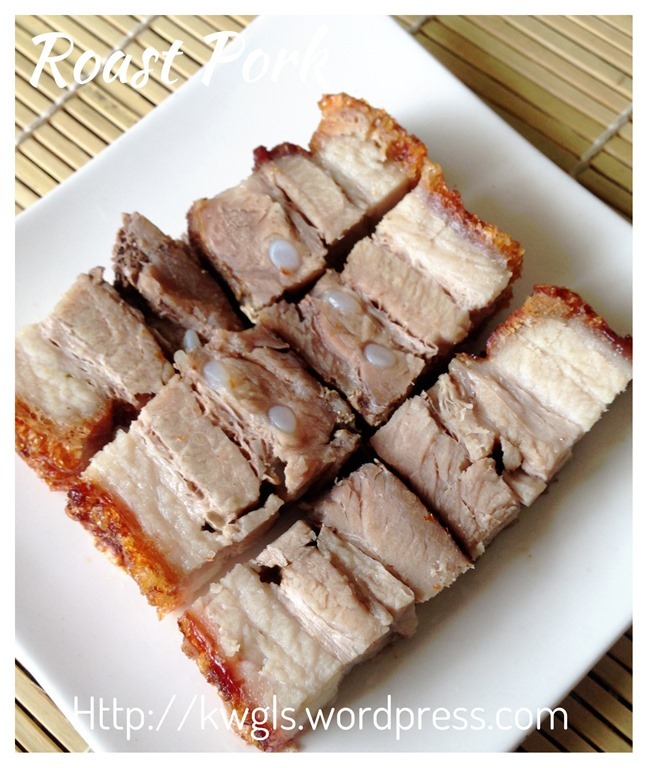 Place the pork in a tray lined with aluminium foil. 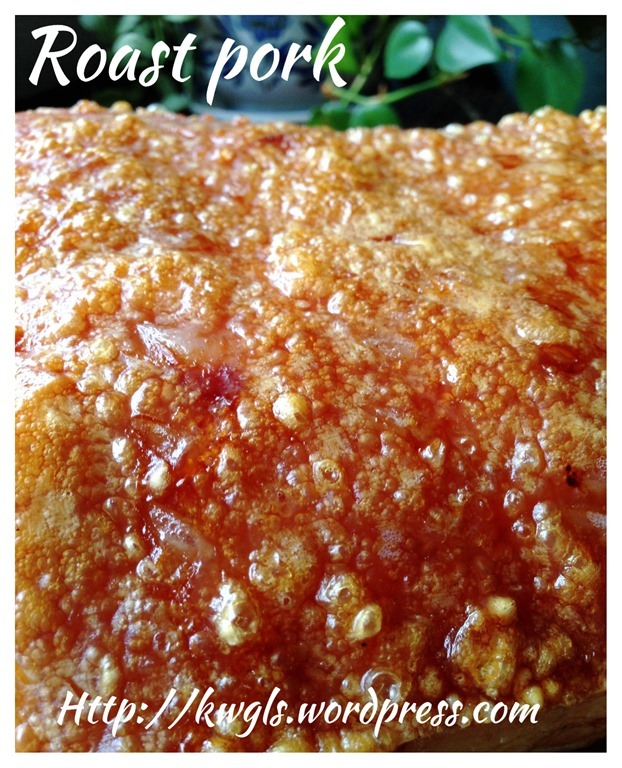 Roast the pork for at least one hour or when the skin become crispy. You can test the crispiness of the skin by inserting a needle into the skin. If you can pierce through, the skin is not ready yet and it will yield a hard and chewy skin.. A crispy skin is one that you can’t pierce through.. it will be very hard and crispy. During the baking, you will see oil starts to sip out from the holes those “frying” the skin… Look out for area of skin that no oil flows out. Use the needle to pierce the skin again. 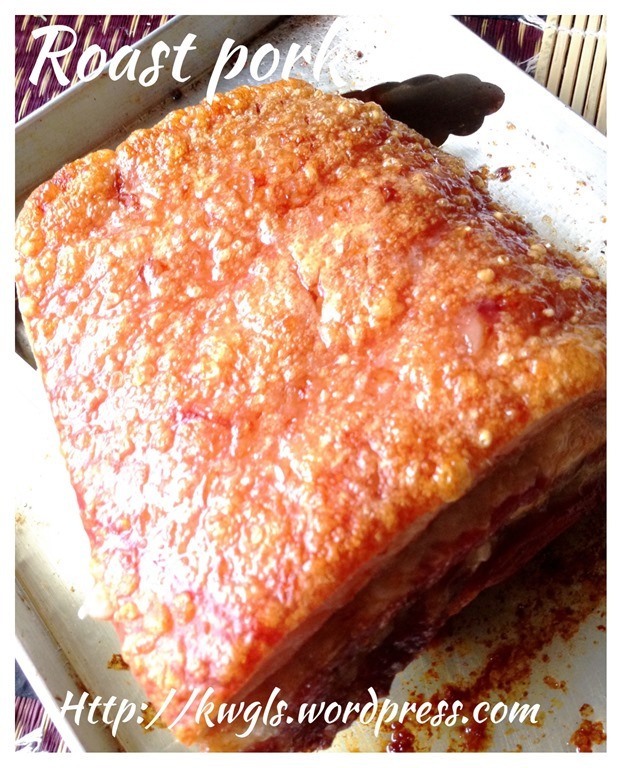 When baked, the fats of the meat will sip out from the skin. It will “fry” the skin and force out the water in the skin. 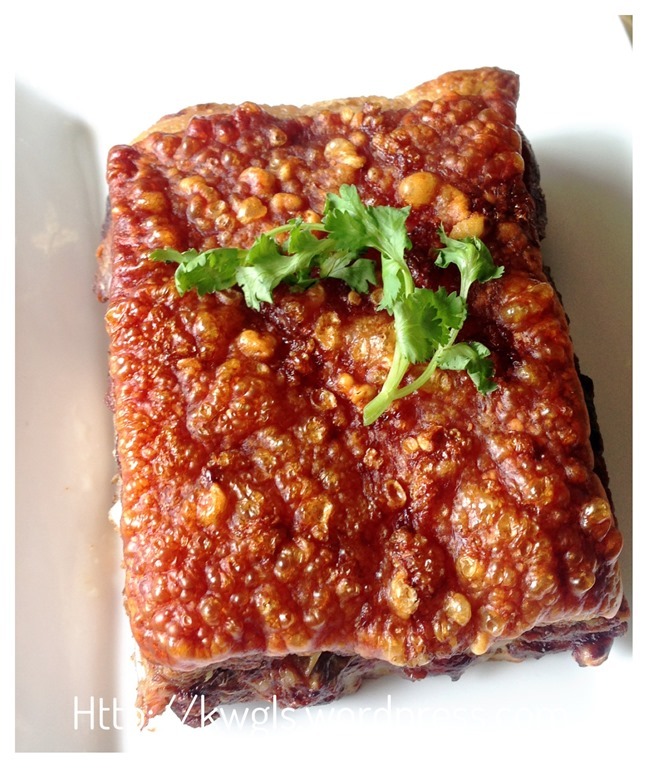 The result is a piece of crispy pork skin. The more holes you have, the better it is.. Feel free to open the oven door to poke holes in the skin at any time you feel like it and it will be much easier to poke when the skin is cooked. Timing of the cooking will depend on the piece of meat you have.. It took me about 1 hours 15 minutes to get to my desired crispiness. Temperature can be lower if there are sign of burning, reduce the temperature turn on the grill mode to proceed. Keep an eye on the process . I am using the big safety pin to poke the skin. There are certain kitchen needles that you can use to poke the skin. 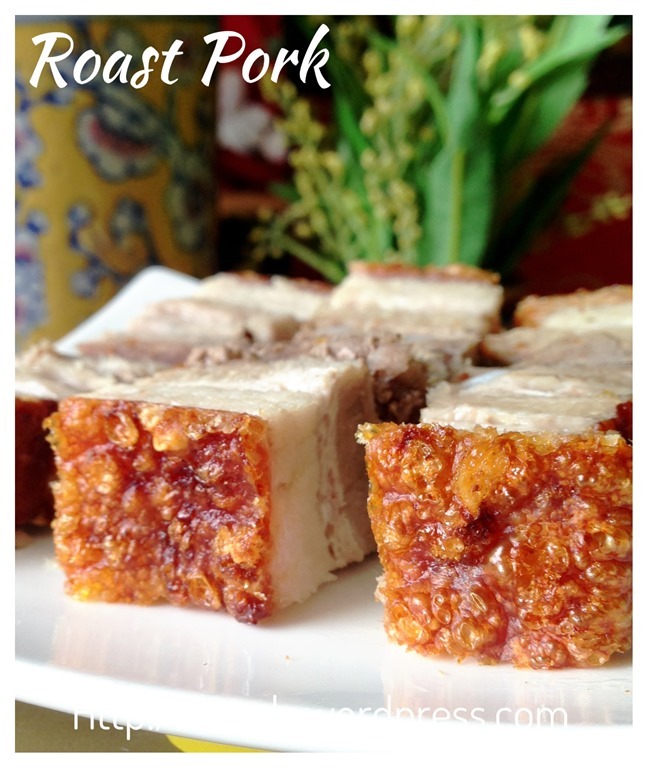 Essentially, there is no recipe for this famous roast pork.. All the ingredients are flexible and up to readers to tailor to meet your taste buds. 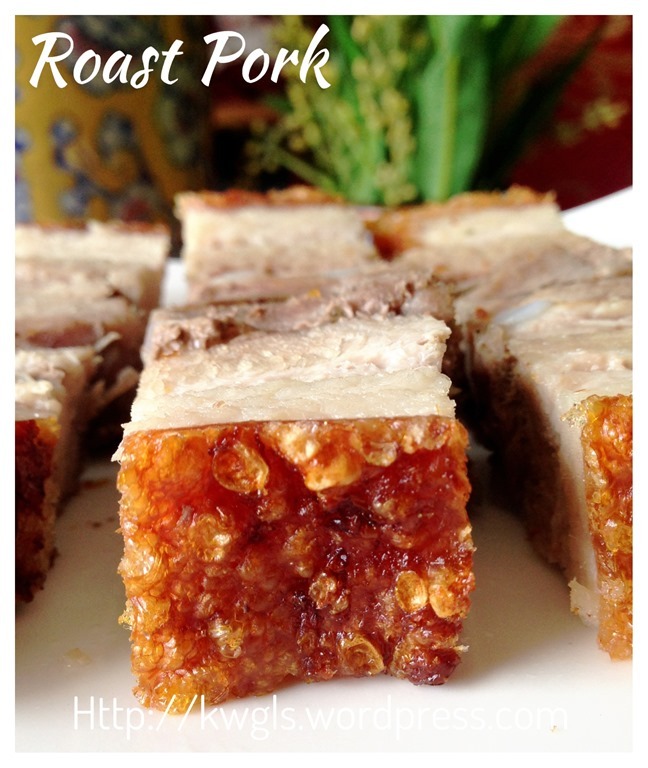 Just remember these few words “dry skin, poke many small holes, poke again during the baking for increase the number of holes, poke until the skin is so hard that you cannot poke”….and you should come out a nice piece of crispy roast pork.. 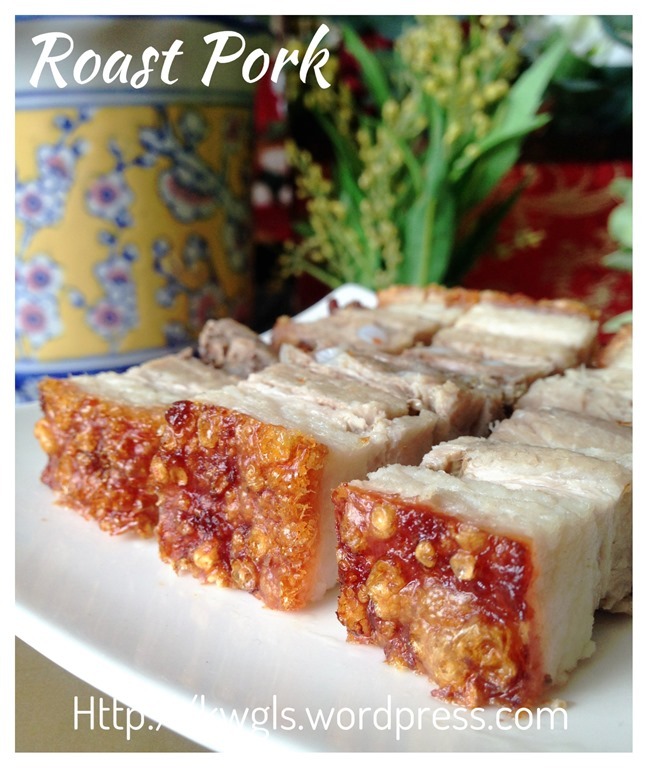 This entry was posted in Food Preparation Series, Meat Dishes and tagged 8, 脆皮烧肉, GUAI SHU SHU, Guaishushu, kenneth goh, postaday, roast pork, sio bak. Bookmark the permalink. There’s no need to rub salt on the skin? No need to put a layer of salt on top of the skin?